Sung Je (성제) and Ji Hyuk (지혁) of South Korean boy band Supernova (초신성) have collaborated in the first OST (original sound track) for Channel A’s drama series “Bachelor’s Vegetable Store,” in which Jihyuk is acting in a role of one of the six bachelors. 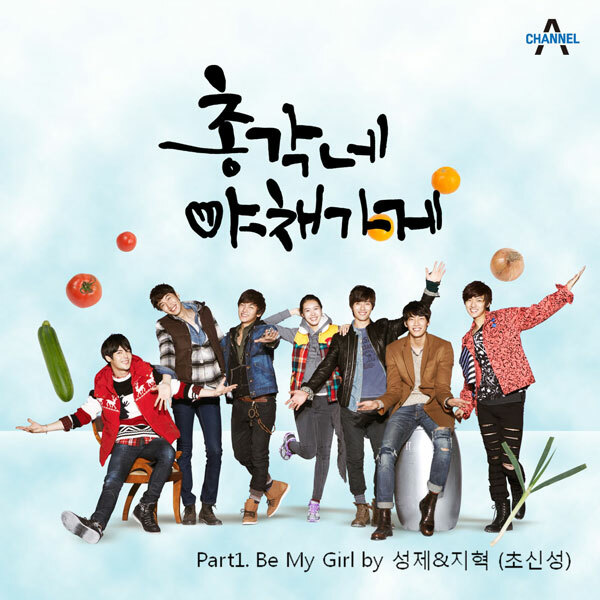 The Bachelors’ Vegetable Store OST part 1 includes the song titled “Be My Girl.” Be My Girl is a medium-tempo pop song in a bright, fun melody with hopeful lyric. The single is written by composer Park Hae Woon who has worked for DJ DOC and Baek Ji Young, and wrote OST for “Boys Over Flowers” and “King of Baking, Kim Tak Goo”. Sungje is singing the song with his tough but attractive voice and Ji Hyuk attempts to rap in a new style, both voices is harmonized through the song. You’ll be my world and It’s you! 오늘도 난 나만의 꿈을꾸고 있어. oneuldo nan naman-ui kkum-eulkkugo iss-eo. (will) be my girl, and feel My world.